Dr. David Duke: The Zio Media Lies: I have not endorsed Donald Trump! 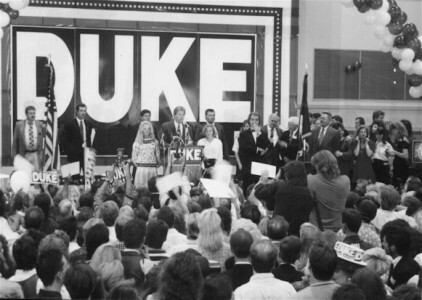 The ZioMedia Lies: Dr. David Duke: I have not endorsed Donald Trump! What I said on my show that I like Donald Trumps position on immigration and I think that he has dared to talk about is a great thing for increasing awareness of the destruction of America with massive immigration. I have been warning the American people for the last 40 years about the catastrophe of massive immigration. It is good to see America has now finally come to see what I warned about decades ago. I don’t know if I will endorse Trump because I haven’t decided yet if I can trust him to do what he says. Ronald Reagan rode to the presidency in part on his pledge to stop immigration, but he actually signed the first and biggest amnesty bill. One thing is sure, I won’t endorse any of the other candidates of the Republican Party, even if I don’t endorse Trump. They are all subservient to the foreign nation of Israel and psychopaths such as Netanyahu. I oppose Trumps support of the Zionist Control of American foreign policy. If as Trump says he is 1000 percent dedicated to Israel, that doesn’t leave much room for dedication to America, does it? Of course the Zio control of American politics and media is proven in that every candidate, both Republicans and Democrats, must swear allegiance to the foreign nation of Israel that has committed Terrorism against us in the terrorist attack in the Lavon Affair — which Israel admitted. Israel also attacked the USS Liberty and killed 34 Americans in a deliberate attack as claimed by our Secretary of State at the time, Dean Rusk. All the candidates are also supporting the release of Israeli spy Jonathan Pollard who did more damage to America than any spy in the history of the United States. I think it is treason to support the Zionist racial supremacist State of Israel which has committed massive human rights crimes against the Palestinians, Lebanese Syrians and others, and who have directly controlled our policy to oppose Syria and support the al Qaeda and ISIS monsters. One can see the media bias by many headlines were Former KKK Leader Endorses Donald Trump. Did the media do this to Robert Byrd, or former Klan Member President Harry Truman? Many show pictures of me from 1976, that’s 39 years ago! Most had no mention of the fact that I won three different elections years later and was member of the House of Representatives in Louisiana, and a Republican presidential candidate. Why the double standard? I believe it because unlike Robert Byrd and President Truman I support America First, not Israel First! 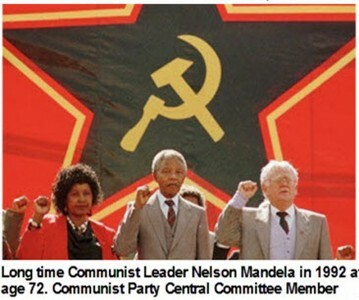 Included here is photo of Nelson Mandela, who was a Communist leader of the Central Committee of the Communist Party. In this picture Mandela is shown with a huge hammer and cycle banner giving the communist clench fist salute. If the Zionist media is not biased why then do they headline my decades old Klan affiliation but never headline Mandela’s Communist leadership? Can any fair-minded journalist not see the ZioMedia hypocrisy?